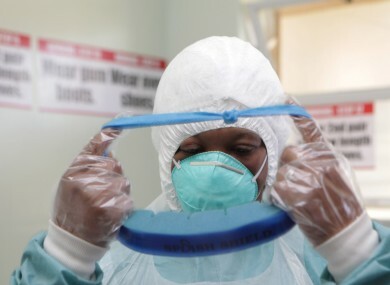 A woman wears protective clothing during a tour of one of the Ebola Centers in Harare, Zimbabwe. THE NUMBER OF Ebola cases will triple to 20,000 by November if efforts to combat the virus are not radically stepped up, the World Health Organisation has warned. The virus has already killed 2,800 people in West Africa. Christopher Dye, WHO’s head of strategy, told the AFP that if the epidemic is not stopped soon “this is going to turn from a disaster into a catastrophe”. The WHO study, carried out with the Imperial College in London, forecast that if no significant action is taken the number of confirmed and probable cases by November will be 5,925 in Guinea, 9,939 in Liberia and 5,063 in Sierra Leone. “We’ve rather modestly only extended the projections to November 2, but if you go to … January 2, you’re into hundreds of thousands,” Dye stated. The United Nations is seeking to raise nearly $1 billion to defeat the worst-ever outbreak of Ebola, which the Security Council has declared a threat to world peace. Yesterday the Irish government announced it had committed to donating €600,000 to tackle the spread of the deadly virus. Members of the Departments of Foreign Affairs and Health are set to meet with NGOs tomorrow to discuss the Irish reaction to the Ebola outbreak. Pat Breen, Chairman of the Oireachtas Committee on Foreign Affairs, said that the meeting, which can be watched here, would provide “a timely opportunity for our Committee to assess the severe impact of the Ebola virus in West Africa with representatives from Goal and Médecins Sans Frontières”. “It also affords members the chance to hear for themselves the actions being taken by our own statutory bodies. Email “Number of Ebola cases could hit 20,000 within weeks”. Feedback on “Number of Ebola cases could hit 20,000 within weeks”.